1. The night before preparing the recipe, rinse the chicken peas and put them in a bowl. Add 1 tsp baking soda and cover with 5 c water. Let them soak over night. 2. Clean the partridges or chicken. Cut the meat off the breast(s), grind it. Sautée the onions in the olive oil until translucent. Remove from the frying pan. Put the frying pan to one side. Let the onion cool and mix them with the meat and the other ingredients except the flour. To make the meatballs the size of hazelnuts dip hands and pieces of ground meat in the flour and make small meatballs. Brown them in the frying pan. 3. If Spanish chickpeas they take up to 1½ hours to cook. If the small chickpeas sold in America they may take as little as 10 minutes. If using Spanish chickpeas rinse them and put them in a pot, cover with 4 c water, bring to a boil and simmer 35 minutes. If petite chickpeas add just before the spinach or chard, see step #6 below. 4. Debone the remainder of the partridge or chicken and put the meat in the pot with the herbs, spices 2 tbsp olive oil. Bring the water to a boil and reduce heat to gently boil for 15 minutes. Add the meatballs continue to gently boil 15 minutes. 5. Dice the cheese. Fry until browned and add to the pot. 6. Trim the spinach or chard and cut into quarters. Tie the bunch with string and add it to the pot with the olives and the chickpeas. Bring to a boil and simmer 5 minutes. 7. Remove two or three meatballs from the pot. Pound them in a mortar. Separate the yolks of the eggs from the whites. Keep the whites from three eggs. Add the yolks to the pot. Beat the whites from 3 eggs to a peak. Add the meatballs from the mortar. Blend in the flour. Cover the contents of the pot with the mixture and stir it on the sides until this dough is cooked. 8. 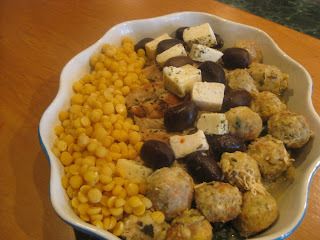 Put it in a dish using the pieces of cheese, olives and meatballs as garnish. Sprinkle cilantro on top and serve.